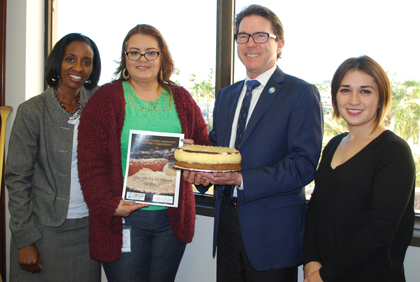 CECO Treasurer Detra Williams, Bake-Off winner Margarita Flores, Bake-Off judge Tom Montgomery and CECO Vice President Nadia Moshirian-Binderup. Come and get it! The San Diego County Employees’ Charitable Organization (CECO) Bake-off winning recipe is now ready to be served. Margarita Flores, a Human Services Specialist with Access Customer Service Call Center, was crowned the 2016 champion earlier last month at the annual CECO Bake Sale at the County Administration Center. Flores won with her beautifully layered carrot cake cheesecake. The competition and bake sale are a sweet way to fundraise and showcase great bakers. Dozens of employees donated homemade cakes, pies, cookies, brownies, cupcakes, biscuits and breads. In the holiday spirit of giving, Flores shared her delicious recipe. It may seem a little tricky, but it’s really as easy as pie (with just more steps). Be sure to read through to the end before starting. To help you out, Flores broke up the recipe into three sections: the carrot cake bottom, cheesecake middle and icing on top. She said while the carrot cake layer is in the oven, start on the cheesecake. And while the cheesecake layer is baking, start on the icing. This will cut down on time in the kitchen and you’ll be able to enjoy eating this scrumptious dessert that much sooner. You can have your cake and eat it too! Fill your belly with carrot cake cheesecake and heart with the joy of giving. Make a donation to CECO this holiday season. Their annual campaign ends this week. Help them reach their goal! To learn how to donate to CECO, visit them online. Spray 9-inch spring form pan with baking spray. In a large bowl mix together walnuts, flour, baking powder, baking soda, cinnamon, ginger and salt by hand. In a separate bowl whisk vegetable oil, sugar and eggs. Then add shredded carrots and whisk again. Combine both bowls of ingredients and mix until well blended. Add batter to spring form pan making sure it’s even. Remove from oven and wrap bottom and sides in heavy foil. Blend cream cheese, sour cream and sugar for 3 to 4 minutes until creamy. Add eggs, lemon juice, vanilla extract and flour to cream cheese mixture and continue mixing for an additional 3 to 4 minutes until well blended. 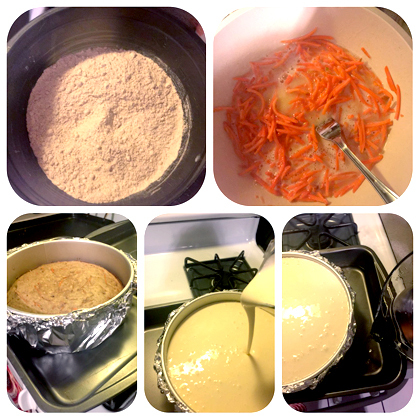 Add cheesecake mix on top of the baked carrot cake. Place spring form pan in a baking dish and fill dish with water halfway. Remove spring form pan from baking dish and remove foil. Add icing to top of the cake and sprinkle with leftover ground walnuts.